According to Stats Can the people who experience the most discrimination, by a long shot, are African-Canadians and Jewish-Canadians. Anti-Semitism and Racism Against African-Canadians is an ugly mark against Canadians. That there are far right white supremacy groups that even exist in Canada is a dark spot on the Canadian flag. Stats Can also identifies racism against Muslims; however, it is far lower than that of Anti-Semitism and Racism against African-Canadians. This is the case, even though it is Islamic Muslim Extremists that have been attacking the West since 911, and killing Westerners especially Christians. This is largely unreported by mainstream media and is reaching genocide proportions in many countries as reported by unbiased (non-Christian) organizations. an average of 90,000 Christians each year [are being killed]…in Muslim dominate countries. It goes without saying that the vast majority of Muslims are moderate Muslims: peaceful, happy and productive members of Canadian society whom Canadians welcome and embrace. Muslim activists are a different story. Activists want to divide us for political gain. Curious that for the first time in Canada, there is a sudden surge of videos this week claiming every day Canadians are suddenly, rampant racists, and the incidents are apparent hate crimes against Muslims, and only Muslims. Curious also that this is following the July 23, 2018 in Greektown of a Jihadi-style attack (claimed by ISIS) by Faizal Hussein. The attack is claimed by his family to be purely the fault of mental illness. It’s a narrative that has some logic if one were to write a Muslim activist script: Islamic Muslim kills two white females on The Danforth triggering acts of racism against Muslims that has been secretly hidden in the hearts of white Canadians. If the narrative is to expose the Islamophobic hearts of Canadians, and a Muslim Activist wants evidence it’s there, just hiding, the Muslim Activist might ask: is it wrong to try and get it out with a little persistent baiting? In the below incidents, the video only records the reaction of the white men, not what precipitated the incident. The white men do consistently claim they were “harassed”, and that the Muslim “started it”, which is not denied by the Muslim. If this is true, this is what is called baiting. A violent or hate-filled response is inexcusable. However, it is appropriate to roll your eyes, walk away, and press record. A Muslim man, along with three or four other Muslim men, apparently asked the white man a question which infuriated the white man. We don’t know what the question was. The recording starts when the white man reacts to the Muslim man. The white says the Muslim man started it by asking him a question. The police state the white man uttered death threats which is, and must be, a crime. A white man in a car appears to be trying to drive slowly away and end the situation, but a man, who appears to be Muslim follows on foot, and apparently wants to keep the conversation going. He apparently calls the white man a racist because the white man is heard to say (with expletives) that he is not a racist. The white man is charged with dangerous driving of a vehicle according to police. The media reported it as a possible hate crime. I include this incident from the UK as well. The Muslim woman is literally trying to drag her son towards a white man’s leashed dog, which the Muslim woman is screaming is a dangerous dog (isn’t that child abuse?) She screams to her friend to take video and call the police on the white man. It’s possible that these white Canadians did just suddenly rear up and attack unsuspecting Muslims with hate and threats of violence. It seems very unlikely. 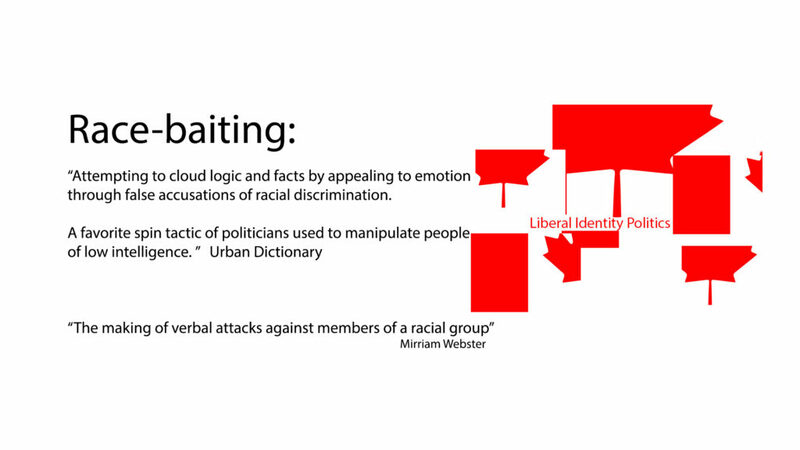 Identity politics is an effort to divide and stir anger amongst people. It is a Liberal tactic to get out the vote by enraged victims. Moderate Muslims are as much the victims as of these tactics as anyone. The Muslim Activist supporters of the Trudeau Liberals are getting desperate. Don’t let them divide us. We must never submit to the will of a small group of Muslim Activists who want to stir Canadian hearts towards Islamophobia to further their political goals. We are Canadians, a people who are welcoming and generous. This entry was posted in Islamic Activism, Sharia Law in Canada, Mainstream Media, Politics, Canada, Think Over News and tagged are canadians suddenly racist, canada, islamaphobia, muslim activists, race baiting, racist incident, toronto ferry terminal.